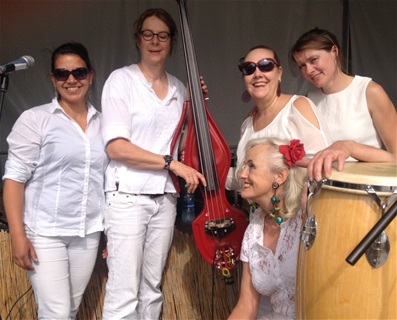 Leticia y su Rumbadama on the Breda Jazz Festival 2019 again? Never change a winning team! Welcome to Leticia's Live Music. We hope you will enjoy listening to the music, watching the videos and reading about Leticia, about her bands and musical projects, about the musicians she plays with, about her cd's and about what we do as the production company: 'Rumbadama Produkties'. We hope we can help you find the live music you are looking for for your event, festival, concert, latin or jazz club, 'baile', party, dinner, product presentation or your 'lazy-sunday-afternoon-music-matinee'. Feel free to call us at any time or send an email with your question. Leticia's Live Music provides high level music in many different forms: from Leticia's fascinating solo show to her 4,5,6 or 7-piece all female Latin band Leticia y su Rumbadama; from the exquisite world-jazz-duo Quartier Latin to the tasteful and swinging Trio Son Cubano; from Leticia's Allround Bottle Music to her brand new duo Bal&Andriessen (premiere was in May 2014). Go to the menu to check out the different options. As Rumbadama Produkties we provide highly professional and complete musical productions, not just the music itself. We also take care of all the logistic and financial tasks involved. If you need more information about this particular part of our work, choose 'Rumbadama Produkties' in the menu.